To discuss issues and to receive a Returns Authorization please contact us. If you want to return any of the goods you received from us (due to cancellation or if you received an item that is damaged, defective or incorrect), we ask you to kindly notify us within 14 days and receive a Return Authorization (RA) Number and return the good(s) a.s.a.p. within 14 days afterwards. For exact details see points 5, 6, 7, 8 and 10 in our Terms and Conditions. To cancel or return an item you may use this Cancellation & Returns Form, but you are not obliged to do so. 1) Contact us to get a Return Authorization (RA) Number from us. 2) Print or request and complete the Cancellation & Returns Form and enclose a copy with your goods. 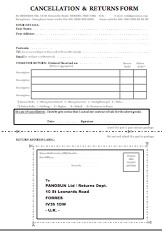 3) Cut off the return address from the returns form and attach to the package. 4) Return the package to the address on the returns form, affixing correct postage. 5) Please retain a copy of your postal receipt for tracking purposes. Please also ask fro a Proof of Popsting at you rpost office, this ias a free service offered at the Post Office. Retain you proof of posting until you receive your refund. 6) Upon receiving your parcel we will take the necessary action to re-send the items you require or perform a refund if necessary. You do not need to use this form, but we we are legally obliged to offer you an easy to use cancellation form in case you want to use it.